Director Armando Iannucci is best known for two television shows; Alan Partridge and Veep. I’ve never seen either, but I have seen the Alan Partridge movie, which I enjoyed. I wonder if Death of Stalin leans more toward Veep, that kind of humor, because I didn’t enjoy the film as much as I had hoped, I think he may have taken the comedy in a direction that simply wasn’t my style. It’s dark all the way through, satyric while giving us true history, and off-kilter in a way that I should have found hilarious, but just didn’t. I was looking forward to this movie very much, I had high hopes for it, not just as a comedy but overall, and I’m sad that it didn’t win me over. In the 1950s, Josef Stalin ruled the Soviet Union with an iron fist. Arrests every day, death lists every evening, plotting in between; it was a time of terror and of shattered dreams, as the utopia that was supposed to be fell apart in its infancy. Even Stalin’s party members and officials lived in fear of his violent whims, and never knew whether tomorrow might mean their own death. But they did not die; he did, in a dramatic twist of fate and of fortune. With the Boss out of the picture, a power vacuum was created, with every high-ranking fiend scrambling for control. This was the rise of Nikita Khrushchev and the Russian army, but their plan to take over didn’t seem so flawless in its beginning stages, and much was in the air before the fate of the world was decided. 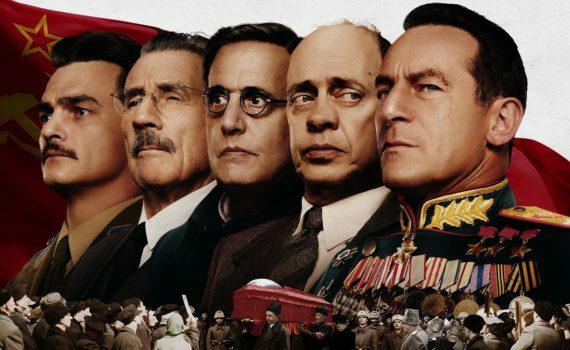 Beale, Buscemi, Tambor, Michael Palin, Jason Isaacs, Paddy Considine, Olga Kurylenko; the cast is the strongest part of The Death of Stalin, really the only element that was always consistent and never let audiences down. The story is insane but true, or mostly true anyway, a look at the bumblings of giants that are guaranteed to crush the lives of countless ants underneath. It’s dark, it’s morbid, it’s hard to swallow, but this is history, and events don’t always shake out evenly or smoothly or intelligently, sometimes the lord of chaos rules. Now, that’s just one element, this film is mostly a comedy, but one that I didn’t find as funny as I had hoped. Early on I did, but the plot became more muddled while the laughs become too few, and I found myself bored more often that not. I didn’t want to feel that way about this movie, I wanted to roll in the aisles. But the humor just missed me, or it fizzled too quickly in all the conniving, and I was left with a very depressing look into the history books without much saving grace. I’m sure there is a certain group that this comedy will strike a chord with, it just wasn’t me, and I can’t predict whether it will be you.